Solid plastic toilet partitions have long lasting durability because they are made with a HDPE (High-Density Plastic Polyethylene) resin. 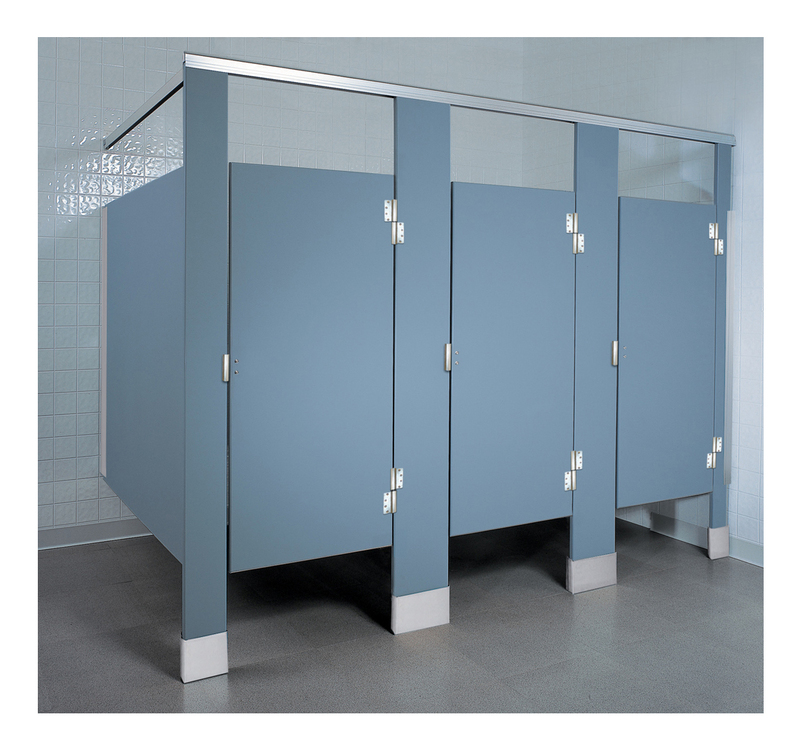 These restroom stalls are ideal for high traffic facilities such as airports, schools, parks, shopping malls, stadiums, YMCA facilities, bars, and many more places that need long lasting partitions. The partitions are designed to stand strong and overcome abuse and moisture. This solid plastic product will not delaminate, dent, flake, crack, rust, bend or break. The material is all 1” thick and is very similar to a cutting board at your house that is made from durable plastic. The plastic material features solid color throughout, which means that minor scratches can often be successfully repaired easily. We recommend solid plastic to be used in moisture rich areas or shower areas, as this product will never rust over time. All the hardware is either stainless steel or aluminum which will never rust as well. Most solid plastic toilet partitions manufacturers provide a warranty of 15-25 years, however, the toilet partitions will last up to 40+ years if properly maintained. Some of the top manufactures include Hadrian Manufacturing Corporation, Global Partitions Corporation, General Partitions, Hiny Hiders-Scranton Products, Knickerbocker Partitions and Accutec Partitions. All six manufacturers offer quick shipping times for fast deliveries to our customers within USA. The most common configuration for solid plastic toilet partitions is an overhead braced floor mounted unit. Adding an anti grip top rail extruded aluminum offers maximum strength, rigidity, and a clean line appearance. All of the material is 1” thick. Door kits have many options from traditional aluminum wrap around or full length piano hinges. The latching for the doors is a standard surface mount slide latch in aluminum or stainless steel. All brackets and door hardware components are aluminum or stainless steel. Pilaster shoes are a one-piece welded design of polished stainless steel. Solid plastic toilet partitions can also be ceiling hung braced which presents a clean, contemporary appearance. They permit quick, easy floor maintenance, especially when combined with wall-hung fixtures. Ceiling hung partitions are recommended for modernization where a drop ceiling or open span construction can be used. In all of the different options for bracing the only thing that changes are the pilasters that go on either side of the doors. The stall doors hinge off and close onto a pilaster. Overhead braced is what the factory’s stock for quick shipping. All toilet partition manufacturers now offer a no sightline solution for maximizing privacy. In addition, most manufactures use a full height, continuous stop, and hinge side filler to completely eliminate all sightline gaps around the door. A full length rubber bumper on the stop deadens sound and protects against wear. The versatility of the no sightline solution means it can be used in new and pre existing installations. Continuous stainless steel channels for all the panels and pilasters to create even more privacy. Partitions and Stalls has been a trusted name in the commercial toilet partition business for over 35 years. We’re eager to help with the configuration, selection, and purchase of solid plastic toilet partitions. Hadrian HDPE Solid Plastic Between Wall Partitions, Solid Plastic (HDPE) Overhead braced floor mounted stalls. Standard stalls 36"x 60"depth(26" door), ADA stall 60"x60"depth(36" door). All standard aluminum brackets and hardware included. Doors can be either in or out swing. Up to 8 standard stalls total or 7 standard and 1 ada stall. All Hadrian partitions colors ship in 5 business days plus 2-4 days travel. To have an ADA stall you must select 1 ADA 24x60, plus 1 standard stall for 1 complete 60x60 ada stall. To have an ADA stall & standard stall, you must select 2 standard stalls and 1 ADA stall 24x60. Hadrian HDPE Solid Plastic Free Standing Partitions, Solid Plastic (HDPE) Overhead braced floor mounted stalls. Standard stalls 36"x 60"depth(26" door), ADA stall 60"x60"depth(36" door). All standard aluminum brackets and hardware included. Doors can be either in or out swing. Up to 8 standard stalls total or 7 standard and 1 ada stall. All Hadrian partitions colors ship in 5 business days plus 2-4 days travel. To have an ADA stall you must select 1 ADA 24x60, plus 1 standard stall for 1 complete 60x60 ada stall. To have an ADA stall & standard stall, you must select 2 standard stalls and 1 ADA stall 24x60. Global partitions complete HDPE solid plastic alcove partitions with overhead braced floor mounted stalls. Alcove stall includes 36" door, 2 pilasters and panel. Doors can be either in or out swing. All standard aluminum hardware included. All toilet partitions ship in 48-72 hours plus 2-4 days travel. Global partitions complete HDPE solid plastic between 2 wall partitions, Overhead braced floor mounted stalls. Standard stalls 36" x 60" depth (26" door), Ada stall 60" x 60" depth (36" door). All standard aluminum hardware included. Doors can be either in or out swing. Up to 8 standard stalls total or 7 standard and 1 Ada stall. All toilet partitions ship in 48-72 hours plus 2-4 days travel. To have an Ada stall you must select 1 Ada 24 x 60, plus 1 standard stall for 1 complete 60x60 Ada stall. To have an Ada stall & standard stall, you must select 2 standard stalls and 1 Aa stall 24x60. Global partitions complete HDPE solid plastic free standing partitions with overhead braced floor mounted stalls. Standard stalls 36" x 60" depth (26" door), Ada stall 60" x 60"depth (36" door). All standard aluminum hardware included. Doors can be either in or out swing. Up to 8 standard stalls total or 7 standard and 1 ada stall. All toilet partitions ship in 48-72 hours plus 2-4 days travel. To have an Ada stall you must select 1 Ada 24 x 60, plus 1 standard stall for 1 complete 60 x 60 ada stall. To have an Ada stall & standard stall, you must select 2 standard stalls and 1 Ada stall 24x60. Global partitions complete HDPE solid plastic in a corner with overhead braced floor mounted stalls. Standard stalls 36" x 60" depth (26" door), Ada stall 60" x 60" depth (36" door). All standard aluminum hardware included. Doors can be either in or out swing. Up to 8 standard stalls total or 7 standard and 1 ada stall. All toilet partitions ship in 48-72 hours plus 2-4 days travel. To have an Ada stall you must select 1 Ada 24x60, plus 1 standard stall for 1 complete 60x60 ada stall. To have an Ada stall & standard stall, you must select 2 standard stalls and 1 Ada stall 24x60. Scranton Products solid plastic between wall partitions traditionally called Hiny Hider Partitions are great for moisture and high traffic commercial buildings. All plastic material is 1" thick, doors are self closing by gravity 8" aluminum hinges or a continuous spring piano hinge, all hardware is standard aluminum brackets. Offering only Classic color collect on the website, all textures please submit drawings for us to quote with color you are looking for. All doors and panels are 55" ht, pilasters are 82" ht mounted to the floor and an overhead aluminum headrail running across the top to support the top of the pilasters. Up to 8 standard stalls total or 7 standard and 1 Ada stall. All Scranton partitions colors take 3 weeks from the time you place the order. To have an Ada stall you must select 1 Ada 24x60, plus 1 standard stall for 1 complete 60x60 ada stall. To have an Ada stall & standard stall, you must select 2 standard stalls and 1 Ada stall 24x60. Scranton products solid plastic corner stalls traditionally called Hiny Hider Partitions are great for moisture and high traffic commercial buildings. All plastc material is 1" thick, doors are self closing by gravity 8" aluminum hinges or a continuous spring piano hinge, all hardware is standard aluminum brackets. Offering only Classic color collect on the website, all textures please submit drawings for us to quote with color you are looking for. All doors and panels are 55" ht, pilasters are 82" ht mounted to the floor and an overhead aluminum headrail running across the top to support the top of the pilasters. Up to 8 standard stalls total or 7 standard and 1 Ada stall. All Scranton partitions colors take 3 weeks from the time you place the order. To have an Ada stall you must select 1 Ada 24x60, plus 1 standard stall for 1 complete 60x60 ada stall. To have an Ada stall & standard stall, you must select 2 standard stalls and 1 Ada stall 24x60. Accutec Toilet Partitions Products solid plastic Ada Alcove partitions. Mostly used in high moisture and high traffic commercial buildings. All plastic material is 1" thick, doors are self closing by gravity 8" aluminum hinges or a continuous spring piano hinge, all hardware is standard aluminum brackets. Offering only Classic color collect on the website, all textures please submit drawings for us to quote with color you are looking for. All doors and panels are 55" ht, pilasters are 82" ht mounted to the floor and an overhead aluminum headrail running across the top to support the top of the pilasters. Alcove stalls include 36" door, 2 pilasters and panel to make up the balance needed. Accutec is located in California. Accutec solid plastic corner stalls traditionally are great for moisture and high traffic commercial buildings. All plastic material is 1" thick, doors are self closing by gravity 8" aluminum hinges or a continuous spring piano hinge, all hardware is standard aluminum brackets. Offering only Classic color collect on the website, all textures please submit drawings for us to quote with color you are looking for. All doors and panels are 55" ht, pilasters are 82" ht mounted to the floor and an overhead aluminum headrail running across the top to support the top of the pilasters. Up to 8 standard stalls total or 7 standard and 1 Ada stall. All Scranton partitions colors take 3 weeks from the time you place the order. To have an Ada stall you must select 1 Ada 24x60, plus 1 standard stall for 1 complete 60x60 ada stall. To have an Ada stall & standard stall, you must select 2 standard stalls and 1 Ada stall 24x60. Accutec partitions solid plastic free standing stalls are great for moisture and high traffic commercial buildings. All plastic material is 1" thick, doors are self closing by gravity 8" aluminum hinges or a continuous spring piano hinge, all hardware is standard aluminum brackets. Offering only Classic color collect on the website, all textures please submit drawings for us to quote with color you are looking for. All doors and panels are 55" ht, pilasters are 82" ht mounted to the floor and an overhead aluminum headrail running across the top to support the top of the pilasters. Up to 8 standard stalls total or 7 standard and 1 Ada stall. All Scranton partitions colors take 3 weeks from the time you place the order. To have an Ada stall you must select 1 Ada 24x60, plus 1 standard stall for 1 complete 60x60 ada stall. To have an Ada stall & standard stall, you must select 2 standard stalls and 1 Ada stall 24x60. Accutec ships from California.